Charlton remain in relegation danger after crumbling against Blackburn Rovers at The Valley. Rudy Gestede gave the visitors the lead and, after Marvin Sordell missed a penalty, the hosts were punished when Michael Keane made it 2-0. Sordell pulled a goal back but Tom Cairney's effort quelled any fightback and maintained Blackburn's slim hopes of a play-off place. Defeat leaves Charlton two points above the bottom three with a game in hand. Jose Riga's side now host Watford on Tuesday knowing that victory will ensure they avoid any final-day drama. However, anything else will mean next Saturday's trip to Blackpool will be a nervy encounter. Blackburn are likely to endure a fraught afternoon, too. They must win at Wigan while making up a six-goal turnaround on the sixth-placed Latics and hope Brighton lose at Nottingham Forest. Gary Bowyer's side will go into that game in good form. Gestede's header from Joshua King's cross set the benchmark for a powerful performance, with King coming close to doubling the lead after Callum Harriott was caught in possession. However, Sordell should have hauled Charlton level after winning a spot-kick just before the break, only for Paul Robinson to make a fine save. The victory was secured just after the hour when Cairney then restored Rovers' two-goal advantage after Jordan Rhodes's shot was blocked on the line by Dorian Dervite. "I hope we will do the job in the next game and not wait for the next one, but the most important thing in our situation is to do what we have to do. "A hell of a lot of hard work has gone into it and we have got to make sure we continue that. "Then we have an important summer because the club as a whole has quite a bit to do still." Match ends, Charlton Athletic 1, Blackburn Rovers 3. 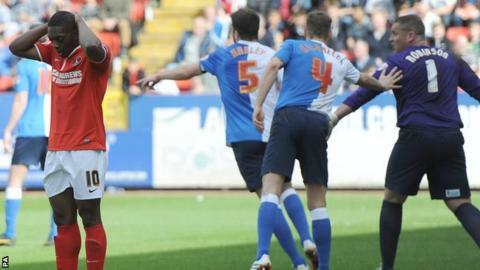 Second Half ends, Charlton Athletic 1, Blackburn Rovers 3. Attempt missed. Davide Petrucci (Charlton Athletic) left footed shot from outside the box is too high. Assisted by Jordan Cousins. Corner, Blackburn Rovers. Conceded by Dorian Dervite. Attempt saved. Rudy Gestede (Blackburn Rovers) header from the left side of the six yard box is saved in the centre of the goal. Assisted by Tom Cairney with a cross. Attempt missed. Liam Feeney (Blackburn Rovers) right footed shot from the right side of the box is close, but misses to the left. Assisted by Tom Cairney. Attempt blocked. Jordan Cousins (Charlton Athletic) right footed shot from outside the box is blocked. Assisted by Simon Church with a headed pass. Corner, Charlton Athletic. Conceded by Michael Keane. Attempt missed. Rudy Gestede (Blackburn Rovers) right footed shot from outside the box misses to the right. Assisted by Tom Cairney. Substitution, Blackburn Rovers. Lee Williamson replaces Jordan Rhodes. Attempt missed. Marvin Sordell (Charlton Athletic) left footed shot from the centre of the box misses to the right. Assisted by Morgan Fox. Attempt saved. Jordan Rhodes (Blackburn Rovers) header from the right side of the six yard box is saved in the centre of the goal. Assisted by Liam Feeney with a cross. Attempt blocked. Markus Olsson (Blackburn Rovers) left footed shot from the left side of the box is blocked. Assisted by Jordan Rhodes. Attempt missed. Johnnie Jackson (Charlton Athletic) left footed shot from outside the box is just a bit too high from a direct free kick. Substitution, Charlton Athletic. Simon Church replaces Astrit Ajdarevic. Delay in match Dorian Dervite (Charlton Athletic) because of an injury. Attempt saved. Morgan Fox (Charlton Athletic) left footed shot from long range on the left is saved in the centre of the goal. Assisted by Astrit Ajdarevic. Rudy Gestede (Blackburn Rovers) hits the bar with a header from the centre of the box. Assisted by Craig Conway with a cross following a corner. Corner, Blackburn Rovers. Conceded by Chris Solly. Attempt blocked. Joshua King (Blackburn Rovers) right footed shot from the centre of the box is blocked. Assisted by Markus Olsson. Attempt missed. Marvin Sordell (Charlton Athletic) left footed shot from outside the box is too high. Assisted by Astrit Ajdarevic with a headed pass. Goal! Charlton Athletic 1, Blackburn Rovers 3. Tom Cairney (Blackburn Rovers) left footed shot from the centre of the box to the bottom left corner. Attempt blocked. Jordan Rhodes (Blackburn Rovers) right footed shot from the centre of the box is blocked. Assisted by Joshua King.